Actually, wedding presents were completely and utterly banned. So it wasn’t a wedding present. It was just a random present for a lovely friend who happened to be getting married to another lovely friend. Whatever it was to be called, I knew what I wanted to buy. And the joy of it was that the shop, in el Centro de Visitantes en El Torcal, was a beautiful 40-minute drive away and it was a calm June morning, not too hot but not too overcast. Forty minutes, usually. And that’s not rushing. It’s such a beautiful road, winding past the thousand-year-old olive tree, through Villanueva de la Concepción, climbing slowly towards the great rocky ridge of the Torcal. First it was goats. 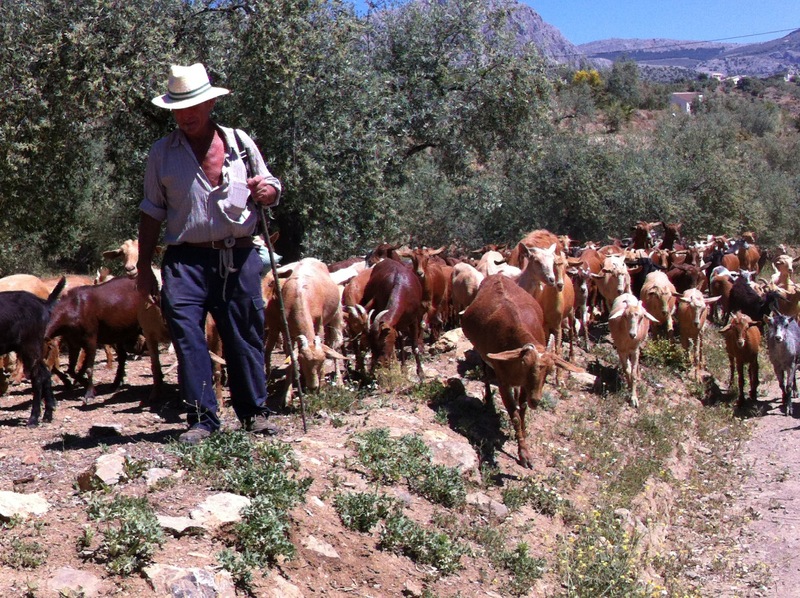 Well, you have to allow 8-10 extra goat-minutes on any trip that isn’t wholly on the autovía. Anyway there was no rush. They were particularly lovely goats. Quite a lot of them. I turned the engine off and snapped a couple of pictures as they buffeted past. A few kilometres on I spotted the horse looking a bit skittish by the side of the road. Sure enough, although I approached very slowly and way across on the other side of the road, it looked petrified so I stopped completely to wait for the farmer to calm it enough to get it back off the road into the scrubland. Eventually the horse stopped shaking, and I slowly inched by. Then it was a tree. 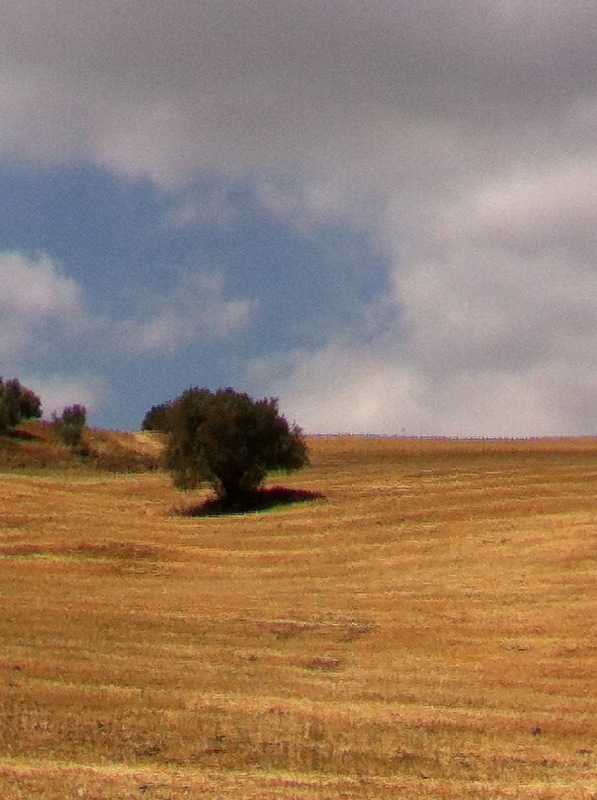 Not in the road, but a tree in a field looking particularly perfect. I love those single trees in the centre of great swathes of corn. Surely they must get in the way for ploughing? But fortunately for us all, they are allowed to remain, standing in majestic solitude guarding the crops. Higher and higher, my ears popping, then more goats. For one silly second I felt a flash of irritation. Then I remembered. I had no appointment, no pressure, just a bit of shopping to do. But even more important than the shopping is to remind myself every day how beautiful Andalucía is, how stunning the countryside is, and how hard the farmers work in this glorious but harsh landscape. So I was happy to sit again, to admire the animals. The two dogs were working and completely ignored my car. I was of passing interest to a few goats – one stuck his head in the car to see if there was anything to eat. The goat-herd tipped his hat, thanked me for waiting (as though there were other options ….) and, after a second 8-10 goat-minutes, the journey continued. Up at the Torcal the shop at the Visitors’ Centre came up trumps as I had known it would. 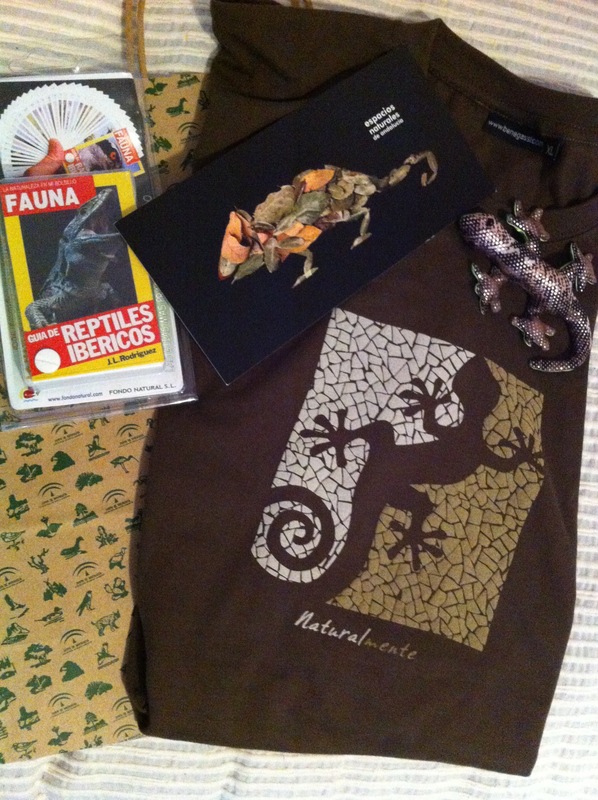 I asked for a t-shirt with un lagarto (lizard) on it, and they had it in stock. Armed with that and a few other charming lizard-related items, I headed out to sit on the terrace awhile. 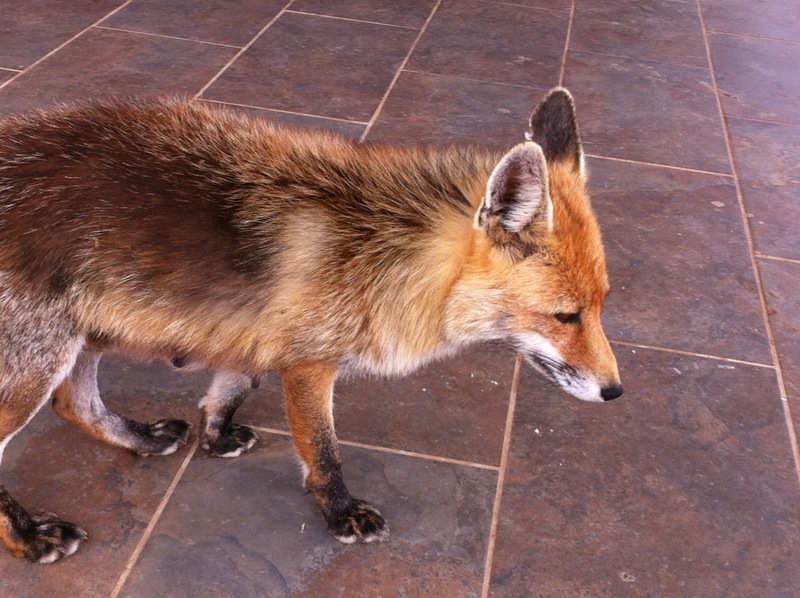 The mother fox was out there scrounging food as usual. Healthy and happy with her shiny coat she is a popular fixture outside the café, collecting food to take back to her cubs. I had a garlicky tomato salad and a good coffee – well, the 40-minute journey had taken an hour and a half so I deserved a break. A quick walk out to the Mirador – it’s a view that never disappoints. Even in the cloud, the extraordinary rock formations take on a different rather spooky atmosphere. Back in the car and I headed downhill, the precious presents that weren’t wedding presents stowed on the floor. 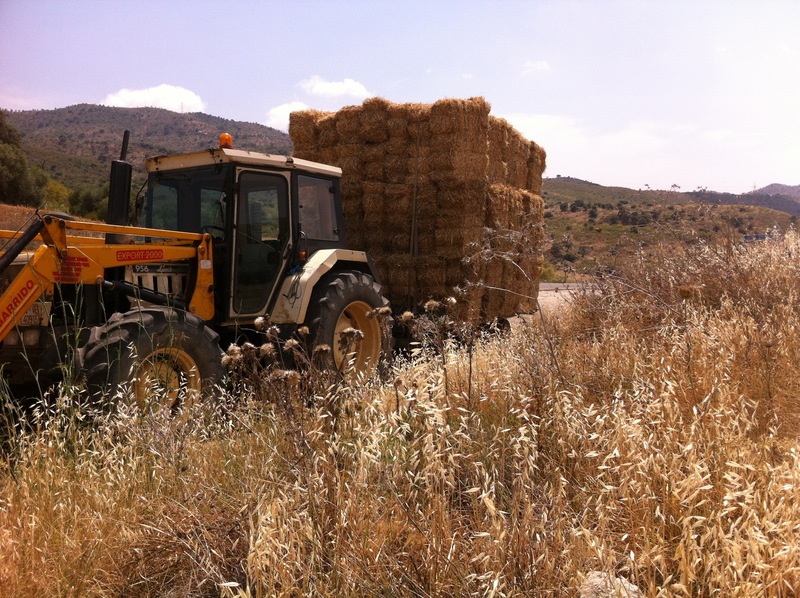 The tractor towing the hay-bales pulled out just before I reached the big field entrance. I slowed behind him to about 5 kph. We crawled down the hill. No good even thinking about passing him, not on that narrow, winding road. An outcrop of colourful foliage caught my eye and I pulled over to take a snap. Within a couple of minutes I had caught up with the hay-bales again. Did you hear the joke about the magic tractor? It drove along the road and turned into a field. Boom-boom! Except this one didn’t – it carried on ahead of me for another fifteen minutes before finally doing the magic trick and turning into a lay-by. Near the soaring arches of the flyover a scrawny cat with a kitten in her mouth hovered by the side of the road, unsure whether to cross or not. I pulled over a good distance before her and used my car to block any traffic that might come along, while she took advantage and crossed over, dumped the kitten and went back for a second. I waited a moment to see if she needed another trip but she seemed settled so I set off again. By Casabermeja I stopped by the side of the road to get oranges from the seller that I trust. “¿Para comer?” he asked. “No, para zumo” I replied. A 5-kilo sack for €3, and a pat on the head for his friendly dog. Five hours after setting off, I carried my oranges and the wedding presents into the house. A trip to the shop successfully completed. This entry was posted in Spain and tagged Andalucia, Axarquía, Colmenar, learning Spanish, Torcal, wedding present by tamaraessex. Bookmark the permalink. It is one of the beauties and delights of living in southern Andalucía, that very few people are in a rush and there is time to take in all that this wonderful country has to offer and, even more, to enjoy it to the full. After almost a lifetime living in the UK and having to get everywhere at a rush to keep this appointment or that appointment, being able to relax about things is so very welcome. 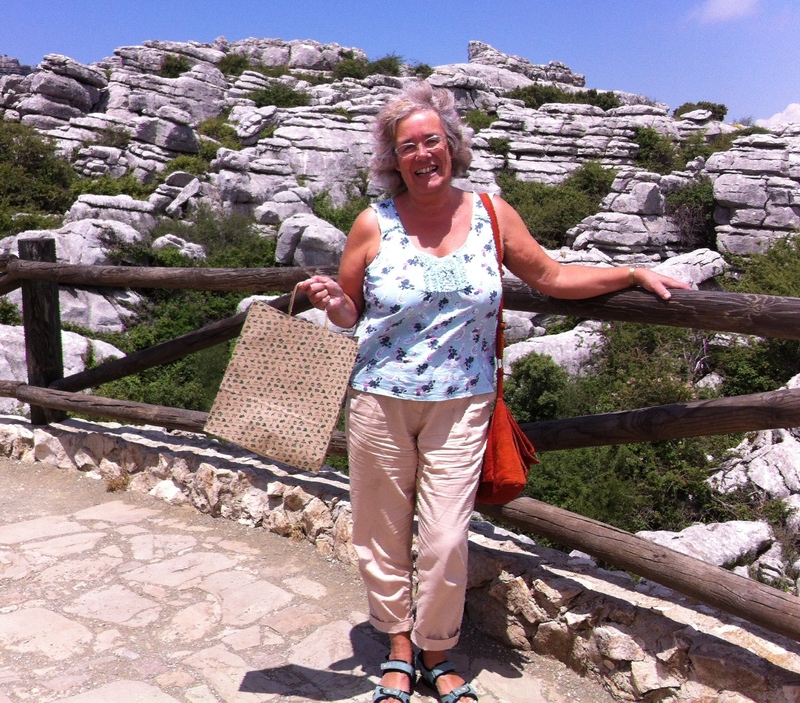 We came across El Torcal by accident a few years ago when we stayed on a camp site near Antequera. It is so beautiful, I have been telling everyone ever since that they MUST visit. We will be going back next time we are down that way. Lucky you living so near. I wonder if the fox is the same one we saw! Ours was was being tormented by a school party of young kids whilst their teachers stood impassively by! So they got told off by me instead!! Antequera is well worth a visit too,a hidden gem not on many tourist trails. No you’ve spelt it perfectly Karen :-). Yes Antequera is lovely. Leave it till September now Janice. WAY too hot to walk it now. I love busy shopping days like these!